Actually. 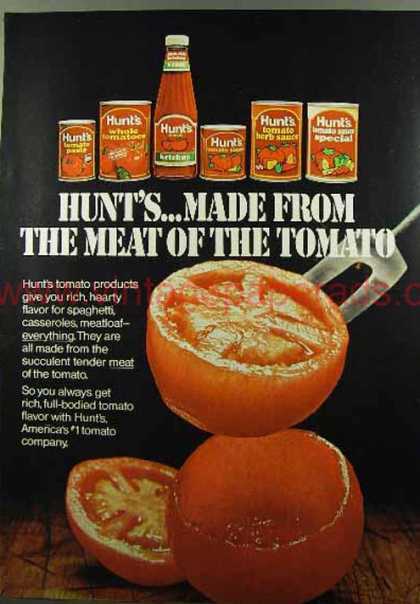 I do believe it is Hunt's now. I have finally found the missing link after hours and hours of looking through vintage ads and historical ketchup references. But I stumbled across this one from 1972 and you can clearly see the arced top to the border around the main body label! Im assuming that the neck label changed a tiny bit from 1972 to 1977. But yes, the Diablo sandwich scene was shot at the Forest Park Old Hickory House, one of (then) about twenty locations of the chain. Today, there is only one OHH left in Atlanta (Tucker) and one in Charlotte which has a review here at Roadfood. I'm not sure what other cities had one. Very good detective work finding those old menus. We used to visit the OHH on Cobb Pkwy - it's been a Mongolian BBQ place called Jade Palace for decades - quite often in the late 1970s/early 1980s so I remember the look of that menu well. Of course, that was long before I learned to like barbecue, and I'd usually have a cheeseburger, which was far better than you'd think, and, as Old Hickory House dwindled and deteriorated, was probably a better option than the barbecue. Maybe I should visit the Tucker OHH, for old time's sake. Shadeone, afraid you haven't made enough posts to unlock the link-posting privilege. Might this be the article that you were looking for? That would be it! Thanks! This is AWESOME!!! I grew up in Stone Mountain in the 70s where some of the movie was filmed (the funeral precession outside of Redan Elementary school) and my neighbor purchased one of the stunt TAs used in the movie. CMT played the edited version last night (which I always hate, but don't have it on disc and the kids were watching it with me) but they had a cute blond on doing the dinner and a movie thing for the Diablo sandwich. While I agree with your substantial research and logic, she presented the Mexican sloppy joe version with ground beef, taco mix, corn, and tomato paste. She did mention that others have substituted ground pork or spicy sausage and jalapeños which would step it up a notch or three. I'm going to try the beef version for the kids tonight and see how it comes out. I'll have to run to Kroger to get some Dr. P before dinner. Take care and keep up the good work! Ladies and gentlemen, I have a new discovery for you all. 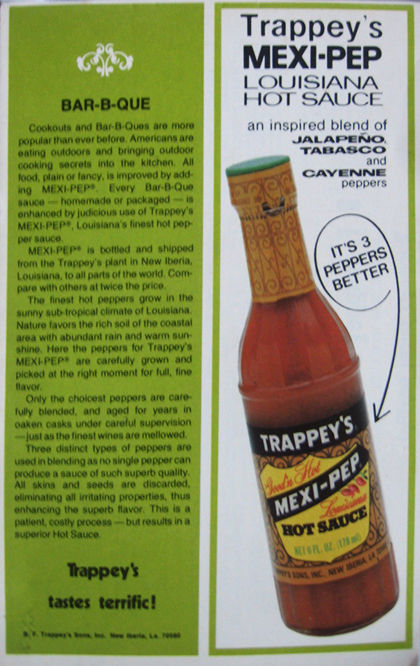 It turns out that its Trappey's "Mexi-Pep" variant and even according to the ad, it goes good with BBQ! 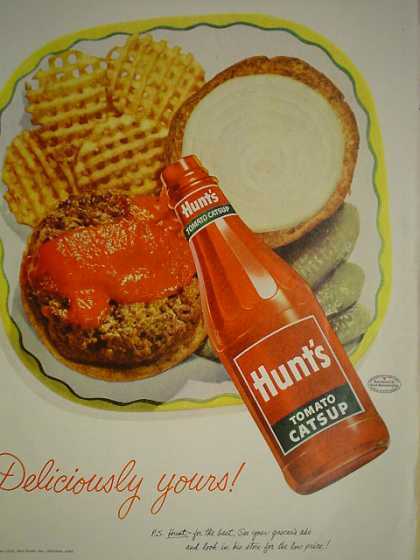 With this new hot sauce discovery and the previous Hunts Catsup discovery, I have updated the meal picture in my original post. For those wondering, pulled pork slathered in the Mexi-Pep hot sauce, washed down with a cane sugar Dr Pepper... is absolutely delicious! If“diablo” originally came from the reference to food being prepared in the fashion known as deviling ( “deviled”), then that might also say something about the sandwich. Particularly if the sandwich was not a new type of sandwich at the time of the movie. Traditionally deviled is having a coating of often mustard, vinegar and spices, often cayenne ... and when speciifically applied to meat it is then grilled. (like on a barbque grill, not on a griddle). This is a more modern (post 1900 or so) meaning. That ingredient combination, btw, is of course what is found in Deviled Eggs .... mustard (which also contains vinegar ... or if dry mustard, then mustard plus vinegar) ... and cayenne pepper sprinkled over the top for color and taste. Going back to the 1700’s deviling or deviled appears to have meant served with a hot spicy sauce or just spicy. In the 1860’s, the Underwood family made a chopped spiced ham product and dubbed the process “deviling” and so the additional concept of the meat being in a chopped state was added. In the movie, the diablo sandwich would appear to be shredded or chopped (rather than ground) in the photos you posted ... look closely at the pics of Gleason with both hands on the sandwich and having just taken a bite. SO ... I’m going to go out on a limb and propose that the sandwich is *not* related to something like sloppy joes ... but instead a shredded pork sandwich where the pork had a mustard/vinegar and spices coating and then roasted or cooked on a (bbq) grill, then shredded. And ... in the way that some barbque sandwiches are done ... I’ll go further out on a limb and say then it is mixed with Mexi-pep or some similar combination and then served on the bun. "Since 1952 folks from all over Georgia have been coming to Old Hickory House for world famous barbeque. We slowly roast the meats over real hickory logs until we get a perfect combination of flavor and juicy tenderness. Then we serve it with our special BBQ sauce made from a recipe that's been handed down for three generations. OHH makes the same promise with it's meats, we serve Fresh Market Barbeque, nothing canned or frozen and the freshest possible product." Scored me an empty bottle of the original Trappey's Mexi-Pep from the 70s to display with my other Smokey & the Bandit memorabilia! Shoot, if the Diablo was just a saucy BBQ sandwich with Trappey's on it, I've eaten many dozens of them. 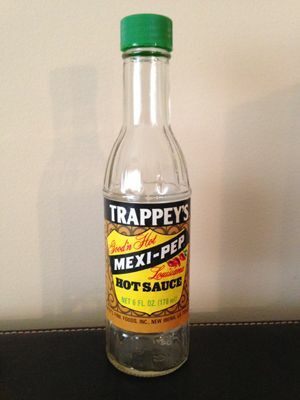 Don't recall ever using Mexi-Pep sauce, but I've used the other Trappey's sauces. Always did like Bull Sauce on a wet BBQ sandwich. This is a most impressive post. I tip my cap to you sir -- you are most certainly a gentleman and a scholar. I'll add this -- but know it is in no way meant to detract from your your important post: I've spent a little time in East Texas (inexplicably I have family there) from whence Sheriff B.T. Justice hails. One town is known (not well-known, but known) for a large poultry company which started there. It's second claim to fame is the Cavender's Western Store empire was started there by a local named, well, Cavender. It's third claim to fame is the Pittsburg Hot Links company. These small hot sausages are served throughout The 903 (this is how the rest of the state refers to East Texas) and sometimes they are served on bread with Louisiana Hot Sauce® (not the Pittsburg hot sauce pictured here which I've never actually seen on any tables in that area). This is the creation that, while I've been in that nape of the woods...neck of the wape, has been referred to as a Diablo Sandwich. Again, let me emphasize that I am not here to favor any theory over any other. I loved this original post and will bookmark it. I just wanted to toss that out there. You sir, present a very good case! 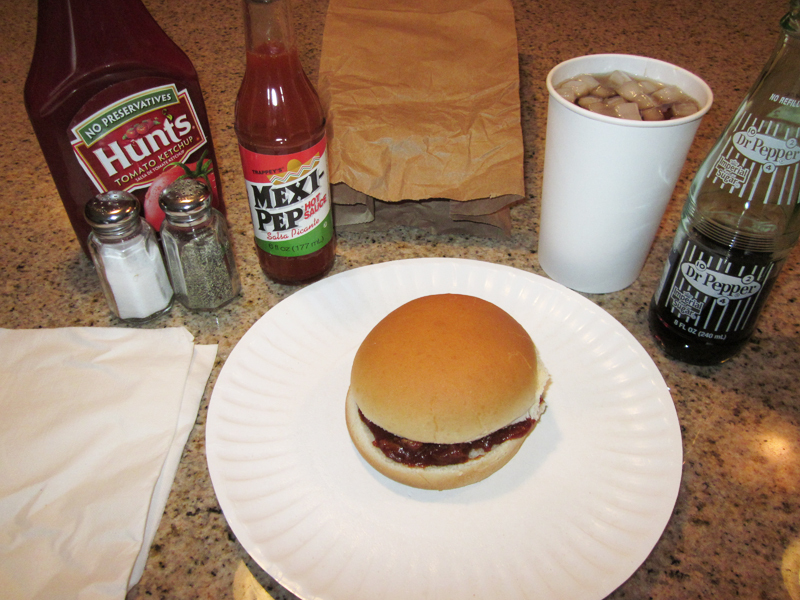 As indicated in my original article, some of the results that came up for "diablo sandwich" on the internet (in multiple cases) included "hot links on a bun smothered in hot sauce". I would say that this was the intent of Gleason's character, most likely to throw a little bit of Texas at the viewer and order something from where Sheriff Justice is from in the story. It may interest people here to know that the Wikipedia article for Diablo sandwich has been flagged for deletion. If anyone here has "reliable sources" they can add to the article (and mention so in the deletion discussion), they might prevent the removal. Note that you'll have to be pro-active in doing so. On Saturday, August 6th, at 9PM central, the channel CMT will be airing a one hour documentary about the making of Smokey & The Bandit, following a showing of the movie itself. I doubt they will, but maybe there will be some talk of the infamous sandwich? I can only hope! I personally don't see any actual link between this recipe here touted as the "original Brunswick Stew" and the Old Hickory House chain, other than the fact that the blogger considers the recipe almost a perfect match for what they have previously tasted at the restaurant. 1. The documentary from CMT was a great film, but the only reference to anything related to the diablo sandwich scene was just the fact that Jackie Gleason wrote his own lines, which we already know. Stir constantly, increase heat to simmer (DO NOT BOIL) for approximately 10 minutes. This post is about as GREAT AS IT GETS!!! I was wondering about the Diablo sandwich the other day, so I googled it. There were several sites claiming to have the "real" Diablo sandwich recipe, but they all just did not seem right. You really nailed it on the head!!! As a fellow investigator myself, who loves to break down movies by looking for things (not just in the forefront, but in the background to see peculiar things, inconsistencies, etc. ), this post made my week! Thank you again for taking the time to break all this down. as a result of your post, I immediately went to Amazon and purchased a case of Trappey's Hot sauce...Cheers!!!!!!!!!!!!!! Welcome to Roadfood Kamikaze. If you ever start wondering about that diner in Adam 12, you'll know where to search first. Thank you again for taking the time to break all this down. as a result of your post, I immediately went to Amazon and purchased a case of Trappey's Hot sauce...Cheers!!!!!!!!!!!!!! Glad to help! What better way to celebrate the film's 40th anniversary then with a good ol' Diablo and Doc? !